That was when the peaceful gathering of UCLA students were “mobbed” and temporarily blinded by neo-fascists wielding flashing cameras and phones on selfie sticks. The Trump supporters, back from antagonizing protesters, were on their way to cars bearing out-of-state license plates. Videos taken by Trump supporters confirm the accuracy of Amugo’s account, showing a gang of a dozen male Trump supporters (plus a token white female) quickly descending upon a group composed almost entirely of female students of color. “Why?” the Trump supporter carrying the camera asks. “Can you just please leave?” The request is still civil. The Unity Block Party was sponsored by student groups including the Afrikan student Union, Samahang Pilipino, Students for Justice in Palestine, the Afrikan Arts Ensemble, the Student Activist Project, and MEChA de UCLA. Students from all the organizations were in attendance. “I think a lot of times, people jump to conclusions about minorities,” she said. “When we want to advocate for peace and love and liberation… they think we are advocating hate and violence. We wanted to change that narrative.” We were far outnumbered by protesters and Trump supporters alike; we could hear both sides shouting on Bruin Walk from the Janss steps, where the unity block party had moved in anticipation of possible violence — from Trump supporters, protesters, or police. “We kind of foresaw the events to come, especially because of previous events at other universities,” she added, referring to the violence that broke out at Berkeley earlier this year in response to the presence of Milo Yiannopoulos, popular right-wing internet troll and former senior editor of Breitbart (he was asked to step down after making several statements in apparent support of pedophilia). The Berkeley backlash propelled Yiannopoulos’s book to the #2 on the New York Times nonfiction bestsellers list. Student Activist Project internship director Azisa Todd gave another reason for moving the unity block party: organizers “really didn’t want the media in this space, because their words can be misconstrued.” Todd also attended the protest briefly, but left because “a lot of non-POC folks were talking and taking up all the space.” They returned to the block party, where they knew they would be surrounded by “more diverse folks.” Their criticism is one I heard repeated by others who attended both the protest and the unity block party. Asian American studies major, Kyla Worrell, found it “empowering to be able to write things like ‘trans power’ and ‘trans justice.’” For them, the unity block party was “very healing—especially comparing that space to going to the actual protest” where there was a “hostile environment.” They cited safety concerns and a desire to be away from the protests as the primary reasons the organizers chose to move the block party. One student, who asked not to be named, shared this sentiment, “They were saying ‘racists, sexists, anti-gay—right wing bigots go away!’ Most of the people chanting were not part of these groups. They were not making space for people actually in these communities to talk.” The anonymous student “kept flitting between the protest and the unity block party,” feeling alienated by cis white male protesters but also compelled to stand up against hate. The Trump supporters continued to subject the students to a torrent of hate, some even spitting on the chalk affirmations. A few of the students attempted to defend themselves from the verbal attacks, but were shouted down. They were visibly shaken. The Trump supporters had invaded their peaceful space, a space the students had hoped was far enough removed from the protest and the neo-fascist event that inspired it to insulate them from such ugliness. Evidently, these men feared the small group that remained, which was composed of mostly women of color. There is no way of knowing how the Trump supporters’ fear compared to the fear of the UCLA students they harassed, but it is chilling to watch the videos knowing which of the two groups benefited from police protection—paid for by the university— and which group contained young, marginalized women who avoided the nearby protest out of fear of violence from neo-fascists, protesters, and police alike. “Amid the chaos, all I could think was that I just didn’t know how we were going to defend ourselves. I knew if we did, we would be the ones criminalized,” Amugo told me. The UCLA students pulled out their cell phones to film the encounter—often the only defense people of color have in such confrontations. “Triggered!” a Trump supporter shouts, mockingly. One of the UCLA students has apparently made the mistake of showing emotion. The unity block party attendees picked up as much as they could and attempted to leave in peace, but the Trump supporters and their cameras blocked their passage. Some students were too stunned to move, and others were baited into speaking with the Trump supporters. When the UCLA students finally gathered enough momentum to extricate themselves from the tangle of shouting Trump supporters, they were pursued by their tormentors. “They were stalking us,” Amugo says. The videos confirm that the Trump supporters followed the departing students, chanting “commies go home” and “Trump, Trump, Trump,” as well as shouting miscellaneous taunts. “It was the first time I had ever encountered such hate for my mere existence in such close proximity. I read about it all the time, but when they’re in your face, treating you like you and other oppressed groups are nothing, it’s an entirely different experience.” The impact of the encounter on Amugo is evident. Watching videos of the incident at the end of the Unity Block Party was like watching a snuff film—a snuff film featuring friends and fellow UCLA students who could not defend themselves from the onslaught of hatred. Young people, many of them women, were terrorized because their school failed to protect them. UCLA, I love you, and that’s why I’m so disappointed. I am grateful to this university for providing me with a world-class education and for supporting me as someone who has faced homelessness and as a survivor of sexual violence. I want UCLA to continue to strive to be a home for all students. I am grateful that UCLA values free speech— but if an outside hate group was protected, why weren’t our students protected? I want to know why administration made it a priority to protect the free speech of men who drove from all corners of the country to harass UCLA students, why administration spent university funds to hire police guards for these bullies, yet did not see fit to invest in similar measures to protect the free speech of UCLA students or even, at the bare minimum, to protect students from physical intimidation. 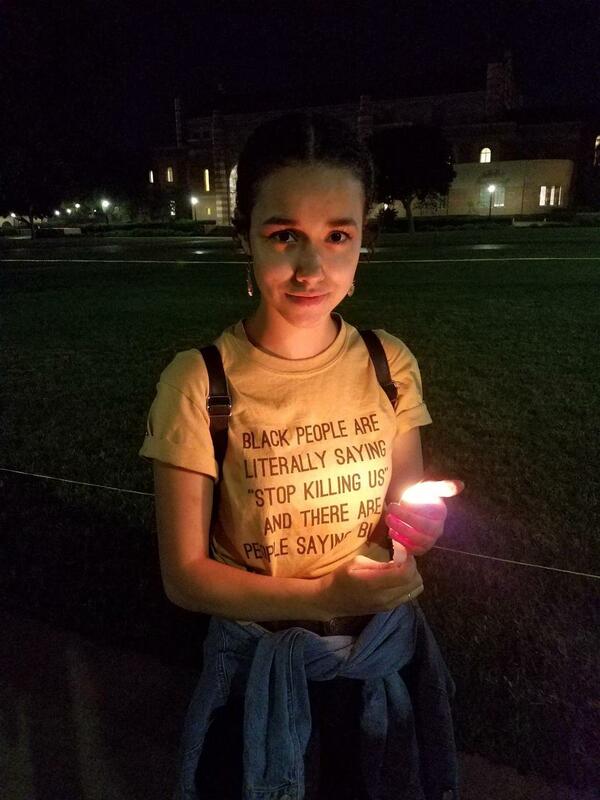 To many of UCLA’s students of color, the administration’s failure to protect them from the itinerant hate-mongers appears to be an oblique endorsement of their violent rhetoric. I am disillusioned, UCLA. The Unity Block Party was not a part of the anti-fascist protests. It was a space for students of color to gather together in solidarity, an escape from a conflict they were too exhausted to be a part of. It was a place for community healing. The disruption of that peace was pointlessly cruel. The interlopers might tell themselves that ruthlessly bullying marginalized youth was just their way of defending free speech—failing to see the irony of the fact that they support a president who has been openly hostile to free speech since day one, threatening his critics with lawsuits and imprisonment, while encouraging his twitter followers to harass members of the press. But whatever ideal the Trump supporters thought they were defending that night, what happened at the end of the Unity Block Party can only be characterized as a vicious and unprovoked attack upon vulnerable students. In order to stand against hate, students of color need their administrators to stand with them. R. Hong is a 20-something anthropology major with an interest in Star Trek and knowing your Netflix password.